1966: There were 9 new fashions that came out this year. 1967: There were 9 new fashions that came out this year including Todd's original outfit. 1968: There were 4 new fashions that came out this year. 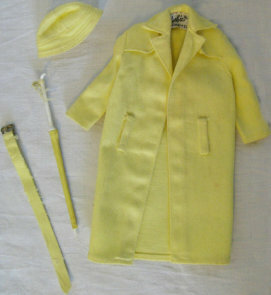 Tutti's tiny little clothes were made just for her in 1966. Her brother Todd could be found only in #3556 Sundae Treat. Beginning in 1967 Chris and Tutti shared their clothes. Todd was sold by himself in 1967 and the outfit he came in was his only one! (In 1969, the ensembles from 1968 were repeated.) These small sized clothes for these three were all discontinued in the United States after 1969. Click the number by the picture to see what's available for purchase!